President Barack Obama went for broke today, announcing plans to introduce legislation by next week: an assault weapons ban, limits on high-capacity magazines, expanded background checks and new gun trafficking laws. Daring the GOP -- polls strongly support the White House on this issue -- Obama also promised to bypass Congress and executive order his way to increased enforcement of existing laws and better communication among federal agencies on gun matters. Talking tough, right? Talking legacy, eh? Not according to a group who believes this is the result of a carefully planned conspiracy to take away U.S. guns and lead us closer to a fascist state. They believe the plot is so elaborate and intricate that the spark of life to this new anti-gun movement -- the murders in Newtown, Connecticut -- was by design or didn’t take place at all. They swear either way it was a faked crime scene, a performance of the most conceptual sort, devised precisely to provoke the kind of outrage we’ve seen since, and which is fueling these new proposed measures. 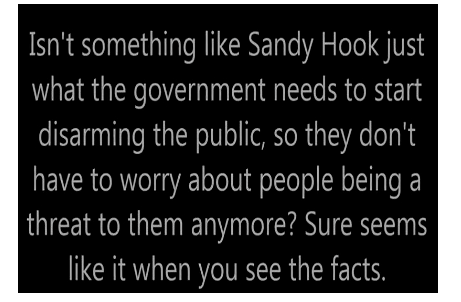 Yes, you’re reading right: The so-called Sandy Hook "truthers" believe the murder of 20 children was a government plot to strip Americans of their guns, a way for Obama the dictator to consolidate his power. Or, alternately, it didn’t happen at all. These conspiracists say no one died and that the grieving parents on TV are “crisis actors” paid by FEMA. At least one man who helped some kids who got away is now being viciously harassed by these "truthers." “I don’t know what to do,” Gene Rosen told Salon. “I’m getting hang-up calls, I’m getting some calls, I’m getting emails with, not direct threats, but accusations that I’m lying, that I’m a crisis actor, ‘how much am I being paid?’”Rosen, who is Jewish, has been the target of anti-Semitic attacks as a result of coming to the aid f the kids. At least one professor, James Tracy from Florida Atlantic University, is buying into the idea of a possible hoax, and an award-winning reporter (okay, an award-winning Fox reporter) has joined the fray. Conspiracy theories are nothing new in America -- September 11 produced quite a few, and the election of our first black president has been a bounty -- but this one is particularly ugly: It combines a shameless disregard for life with a weird anti-Semitism and a virulent and racist hatred of the President, hoping to incite popular fear. Obama went for broke today knowing full well he can’t get everything -- that, if he’s lucky, only a part of it, perhaps the background check -- will pass. Anybody looking at our government gridlock knows there’s no way the big stuff will get through. But these conspirators -- cowardly, reckless and enraged -- are only the tip of the continuing resistance to a basic, basic fact: The United States has elected a black man president. Twice. By indisputable margins. And they, still, just can&apos;t abide that.